Chief Justice of Nigeria Walter Samuel Nkanu Onnoghen. Nigerian government on Tuesday said it demands the resignation of the chief justice of Nigeria Walter Onnoghen over the alleged refusal to declare bank accounts despite being a Supreme Court judge since 2005. The Nigerian government is suing the CJN Onnoghen for refusal to declare his assets in breach of the provision of the Code of Conduct Bureau Act. He is also being accused of maintaining domiciliary foreign currencies account which comprised Dollars account, Pound Sterling Account and Euro account which are alleged to be contrary to relevant laws, especially for public office holders. Onnoghen was scheduled to face trial at the Code of Conduct Tribunal (CCT) over the non-declaration of assets on Monday, 14 January. The trial was adjourned to till today, Tuesday, January 2. The offence contracts the Code of Conduct Act and could draw penalties if established by the CCT. At the hearing, government prosecutor Aliu Umar said that the government wants the judge out of office. Umar, in his opening address at the resumed hearing in the matter, said Mr Onnoghen had been written and wondered whether he had received government's demands for him to be out of office or not. For the second time of the hearing, Onnoghen was not present when the tribunal opened at 10:21 a.m. He was also absent at the first hearing on Monday, January 14. 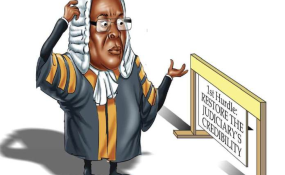 A federal high court ruled last week that Mr Onnoghen's trial is suspended, but government supporters have argued that the ruling was an anomaly because the tribunal has parallel powers as federal high courts. They argued that only the Court of Appeal could issue rulings that would be binding on the tribunal. The Court of Appeal fixed January 24 for hearing on the matter. Wole Olanipekun, a senior lawyer leading a team of over 50 defence counsels for Onnoghen, said the judge was absent because of the cases that were instituted against the tribunal's proceeding.